The PayPal co-founder comes up with another potentially game-changing idea. Elon Musk, CEO of Tesla Motors Inc. and Space Exploration Technologies Group (SpaceX) is rapidly gaining a reputation to rival that of the late Steve Jobs, or boundary pushing British businessman Richard Branson – whose Virgin Galactic stands alongside SpaceX as pioneers for the future of commercially viable space exploration and travel. Indeed it was with Steve Jobs-esque spectacle and fanfare that Musk unveiled his Hyperloop transport system this last Monday. The reaction has been similar to an Apple product release, including the intense media interest as well as the internet buzz and speculation, even if in this case the Hyperloop system is still just theoretical (Musk’s paper available here). 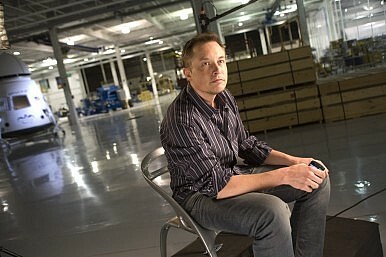 Musk has a strong reputation for challenging business or technology areas which he deems to be outdated, inefficient or wasteful. His first major claim to fame was as co-founder of Paypal, now an internet powerhouse that challenged traditional banking and payment methods and spurned a multitude of copycats around the world. Having sold out of Paypal, Musk went on to back two more potentially game changing companies. Tesla Motors Inc. has already created a world-beating electric car and has pushed out an electric vehicle grid in the US. SpaceX meanwhile is working (along with companies like Virgin Galactic) to achieve the dream of making space transport and orbital lift into a commercially viable enterprise – which many hold to be a vital step if humanity is to continue its so-far government driven and horrendously expensive leap towards the stars. This time, Musk appears to be annoyed at the huge cost of the proposed Pacific coast high-speed train link between Los Angeles and San Francisco, which he estimates will overrun the budget and eventually cost up to $100 billion. Hyperloop, which Musk proposes will be solar powered and is based on existing technologies, is intended to be cheaper (at only $6 billion – $10 billion), quicker (with intended speeds of more than 800 mph, or 1300 kmph), and less disruptive in terms of land use along the route. Musk himself admits that the system would only be viable for cities less than 1000 miles apart. Of course we should always step with caution when faced with fantastical, world-changing, disruptive technology proposals. Yet this time, Musk’s reputation and record of success in other areas is encouraging a lot of serious consideration around the world. This is not surprising, considering the recent massive roll-out of “traditional” high-speed rail in significant emerging markets (such as China) and the renewed burst of activity in developed countries such as the United States and United Kingdom (which have long been behind developed rivals Japan and France in high-speed train use). Musk’s proposal and track record are probably also causing some uncomfortable worrying in various transport departments, even if just a little! For now speculation remains focused on whether Musk will attempt a prototype himself (using one of his companies) or will stick to his original plan of allowing a third party to develop the technology. He remains fairly aloof on the topic. Whether it be Tesla, Virgin Galactic, SpaceX, Google (through its Google X facility) or others, there are a whole bunch of sci-fi level projects receiving significant funding, publicity and support in the world right now. Significantly the most interesting and high profile of them seem to be located in the United States (even British businessman Branson’s Virgin Galactic is based in New Mexico). Given that such projects so successfully captivate global attention, and are surrounded by wonder, hope and optimism, there is a big question for the world to ask as to why so many of these projects are based in the U.S. Hopefully though, this fact is pushing the rest of the world into building the financial, political, social and educational (and media!) infrastructure to catch up.